By CHARLES C. BASS, M,D. 1430 Tulane Avenue New Orleans, La. *Studies promoted by facilities to which the Author has had access at the School of Medicine, Tulane University of Louisiana, and by aid for equipment and supplies provided by the University. Maintenance of dental health and of reasonable oral cleanliness can be accomplished only by effective personal oral hygiene. To prevent the initiation and further progress of caries and periodontoclasia, one must clean his teeth right, every night before retiring. However, cleaning the teeth at other times also promotes still greater oral cleanliness. The teeth can be cleaned well enough to prevent disease and to maintain reasonable oral cleanliness only by the proper use of the right kind of both toothbrush and dental floss. Both the brush and the floss must have the characteristics which are necessary for the functions they respectively serve. The functions of dental floss and specifications for the most effective and most appropriate floss for personal oral hygiene are presented in a companion paper.1 The functions of the toothbrush and the optimum characteristics of brushes for personal oral hygiene are preserved herein. Proper use of the toothbrush is necessary to clean all the exposed surfaces, pits, grooves and spaces about teeth, which can be reached by the bristles of the brush. The material to be removed consists of (a) food material of all kinds that may have been retained about the teeth since the previous cleaning, (b) microorganismal material that has grown and accumulated at these locations since the previous cleaning, or prior thereto. completely on the occlusal surfaces and to make up a considerable pad between teeth and around the contact point (Fig. 1). The outer edge of the biconcave disc of bacterial material around the contact point comes to the sides of the two contacting teeth and, at this location, is within reach or the bristles at the toothbrush. Deeper in, the space is too narrow for the bristles to enter. An important feature of the bacterial film on teeth is that the deeper part of it generally consists largely of long rods or filaments closely packed together (Fig. 2). One end of the organism is attached to the enamel cuticle2 from which it extends outward toward the surface of the film. At the surface of this constantly present bacterial film there are many bacteria of different types, varying largely with the oral flora. These are on the surface and among the growing ends and fruiting heads of the rod-shaped and filamentous organisms of which the deeper part of the pad is composed. Food material, during mastication, is thoroughly and heavily inoculated with the many and different bacteria in in the saliva, derived from all the different surfaces within the mouth. These bacteria, in material retained about the teeth, rapidly multiply, some more rapidly than others, according to the favorability of the substrate, number and variety of bacterial cells in the inoculum, and many other variable factors. Whenever favorable carbohydrates are applied to the surface of the bacterial film pad, either in solution or in particles of food, production of acids occurs. Some carbohydrates, when applied in solution to the accumulated film pad, produce acids quickly.3 On the other hand the same carbohydrates mixed with other food material in particles of food inoculated and lodged upon, the bacterial pack in grooves, pits and sulci about teeth, break down more slowly; acids are thus produced more slowly over a longer period of time. Such acids produced at the surface of the bacterial film pack are carried, as if by a sponge or wick, through the filamentous material down to the cuticle at the surface of the tooth and pass through the cuticle to the enamel. If these conditions are frequently renewed and continued long enough, microscopic decalcification of enamel occurs, giving rise to the early, "white spot," stage of caries. If continued much longer the enamel at this point breaks clown producing a cavity - the advanced stage of caries. Food particles containing little or no fermentable carbohydrates, but a larger proportion of protein, favor the growth of other bacteria including putrefactive bacteria. Little or no acid is produced but instead the foul smelling products of putrefaction are formed giving rise to unclean and malodorous conditions. Although caries is not produced, this kind of decomposition about the teeth is quite as objectionable in other ways. A most important effect is promotion of the deposition of concretions or calculus on the tooth and the resulting periodontoclasia. Decomposing food about teeth can be removed by the proper use of the toothbrush to the extent that the bristles can be forced into the spaces containing it. The action is mechanical by which the material is broken up and dislodged by the digging action of the ends of the bristles when the brush is held firmly against the place to be cleaned and is moved back and forth, or from side to side, by several short strokes, so as to force the bristles into the pits, grooves and spaces as far as their diameter will allow them to go. During the period since the previous cleaning, considerable growth of bacteria has taken place in the outer portion of the film pad, even if no food material rested upon it, and still more, if remnants of food were there. Proper use of the brush breaks up, dislodges and thus removes much of this most rapidly growing part of the bacterial material. Although not all of it has been removed, most of the actively growing part has been, and at the same time most of the food material. Such brushing should always be followed by vigorous rinsing to remove loosened particles of bacterial or food material. In an area cleaned in this way from food which could serve as bacterial nutritive material and from a large part of the most viable bacteria, not much growth of bacteria takes place, there is no appreciable further decomposition of food and no harmful acids are produced, until more food material is lodged again at this same place. The two most important locations for the occurrence of enamel caries are (a) at and about the occlusal pits and fissures, (b) at and about the proximal contact points between teeth. The toothbrush is the sole dependence for cleaning and preventing caries at the occlusal surfaces. It is of much use in cleaning the approximal surfaces. When properly used, it dislodges food material that is lodged upon the edge of the bacterial film pack between teeth, and also the bacterial material itself to the extent or depth the bristles can penetrate the space. To this extent the toothbrush can contribute largely to the checking of further progress after early stage lesions have developed. The significance of this foreign-body effect was recognized by Dr. John W. Riggs5 in 1876 who correctly asserted, at that time, that the early stage of suppurating inflammation (early stage periodontoclasia) is caused by the accumulation of accretions and roughened surfaces on the teeth at the gingival margins. He substantiated his claims by the prompt relief he secured by carefully removing the concretion, tartar or roughness and polishing the tooth. Attached to, and resting upon, the surface of the concretion( calculus) within the crevice there is a pad of bacterial material consisting largely of rod and filamentous forms. One end of many of the organisms making up the pad is attached to the tooth or to the concretion upon it. At the outer surface of the bacterial pad within the gingival crevice there are the growing ends and fruiting heads of these rod and filamentous bacteria, among which there are large numbers of other bacteria of many varieties, spirochetes and often ameba (Endamoeba buccalis).6 This bacterial material extends to, and overlaps to some extent, the zone of disintegrating epithelial attachment cuticle - zdeac* - and probably promotes the disintegration which goes on there. An important function that is served by an appropriate toothbrush, properly used, is to dislodge and remove the soft microscopic material at the entrance to, and within, the gingival crevice, to the extent that these are accessible to the application of the brush. Having this general view of the functions of the toothbrush we may proceed to consider the characteristics which are necessary for the most effective and practical brush. During recent years, synthetic plastic materials have taken the place, almost completely, of all other material for the stock or body of the toothbrush. They are entirely satisfactory from every standpoint and superior in many particulars. Prior to the last war, natural bristles were used for toothbrush bristling. This material was imported largely from China and Russia but the supply became limited during the war. For several years just prior to and during the war manufacturers turned to synthetic plastic filaments for toothbrush bristles. Most of these were unsatisfactory. More recently high quality nylon has become available and these nylon bristles are so superior, in most respects, that it is the only material to consider at the present time. The high quality nylon now available to manufacturers should be used for toothbrush bristling to the exclusion of all other material. Some of the advantages of this high quality nylon filament now available are: (1) bristles are uniform in cross section (natural bristles are not); (2) uniform in size; (3) available in a wide range of diameters; (4) do not split; (5) do not become soggy but remain lively and resilient; (6) high abrasion resistance' against wear; (7) ends of bristles can be made smooth and round by mechanical means; (8) withstand many months of daily usage without appreciable deterioration. The size and shape of the stock (handle and head) should be designed for easy and natural manipulation in applying the brush to the surface of the teeth, and the areas about them, to be cleaned. A plain straight handle design can be used more successfully and more effectively than any other. There is no good excuse for crooked, twisted or other distorted shapes of toothbrush handles. The over-all length should be about 6" and the width about 7/16". There should be three rows of bristles, six tufts to the row, evenly spaced. The stapling and setting of the bristles are standard manufacturing procedures and need not be considered here. No manufacturer can afford to make brushes in which the bristles shed. High quality nylon filament for toothbrushes is available in sizes from .014" down by .001". Most toothbrushes are now made with .012", .013" or .014" bristles. Much experimenting with all sizes, and study over a considerable period of time, has led the author to conclude that .007" filament is the right size for the purpose. Although no doubt slight deviation from this size may be permitted without serious impairment, any such deviation reduces the over-all effectiveness and suitability of the brush in proportion to the extent of such deviation. It will be noted that this size .007"- is exactly one-half the diameter of the coarser .014" bristles now generally used in "hard" brushes (Fig. 4). It is desirable to consider here some of the advantages and indications in favor of the smaller size. Injury to the gums is the most general harmful effect of improper use of inappropriate toothbrushes. Frequent traumatizing and injuring the border of the thin gingiva upon the enamel covered crown gradually wears it off from the enamel and forces it to recede beyond the cemento-enamel junction. This occurs especially on the labial and buccal surfaces and on those teeth which are most exposed to the usual long stroke harmful type of brushing. Normally the epithelial attachment extends from the cemento-enamel junction occlusalward to its outer border at the zone of disintegrating epithelial attachment cuticle - zdeac7 - within the gingival crevice. Were it not for disease (periodontoclasia) or injury (mostly by the toothbrush) there would be no change from this location throughout life. Most people who have brushed their teeth for at least a few years, with the current types of brushes, have already sustained more or less permanent damage to the gingiva about some of their teeth. The margin is worn back more and more and the epithelial attachment recedes until the cemento-enamel junction is passed and a narrow strip of cementum is exposed. Now, as the brushing is continued, grooves are cut in the exposed softer cementum and underlying dentin. The rapidity of cutting, and the extent of these grooves is influenced largely by the vigor and character of the stroke of the brush, given by different individuals, and by the abrasive effect of the dentifrice the individual uses. While enamel is not cut or injured by any except the hardest abrasives, exposed cementum and dentin may be worn or cut by long continued use of even very mild abrasives. This condition in which the gum has been worn back entirely from the enamel and more or less abrasion at the necks of some of the teeth can be recognized, represents an advanced stage of toothbrush damage while it is easy to recognize now, there was an earlier stage and less deviation from the normal which would have been uncertain or difficult to recognize. Under these circumstances it is hardly practical to determine accurately the frequency of this kind of injury. Different observers will be governed by different criteria. One will recognize earlier stage lesions than another. Actually one who looks for this injury and is alert to recognize it, will find it, to a diagnosable degree, in practically all people who have used current types of toothbrushes for any considerable period of time. It is practically universal among users of current toothbrushes. Anyone who is interested can confirm this statement by looking for brush injury on his own teeth and on those of others whom he examines. Few people, who have used toothbrushes, will be found whose gums have not been worn back more or less on some of their teeth. Based upon a study of 200 individuals, Kitchin8 found abrasion of some extent in 42 per cent of individuals in the 20 to 29 year group and 76 per cent in the 40 to 49 year group. Exposure (gum recession) conditions capable of developing abrasion were determined as 58 per cent in the 20 to 29 year group, 84 per cent in the 30 to 39 year group and 96 per cent in all over 40. It is true that this type of injury is promoted largely by improper, long stroke, vigorous use of the toothbrush applied excessively at certain locations, and would not occur to such an extent if everyone used his brush more cautiously. Nevertheless, most people do not know how, or do not take the care, to use their brush so as to minimize the damage. Neither do they recognize the microscopic injury they produce with it. It is especially desirable, therefore, that the scratching strength or stiffness of the bristles of the toothbrush should not be sufficient to injure the gums, however it is used. The diameter of bristles of a given length determine their stiffness and resistance to bending; and this in turn indicate the strength with which they can scratch and injure the thin tissue at the thin outer gingival border. 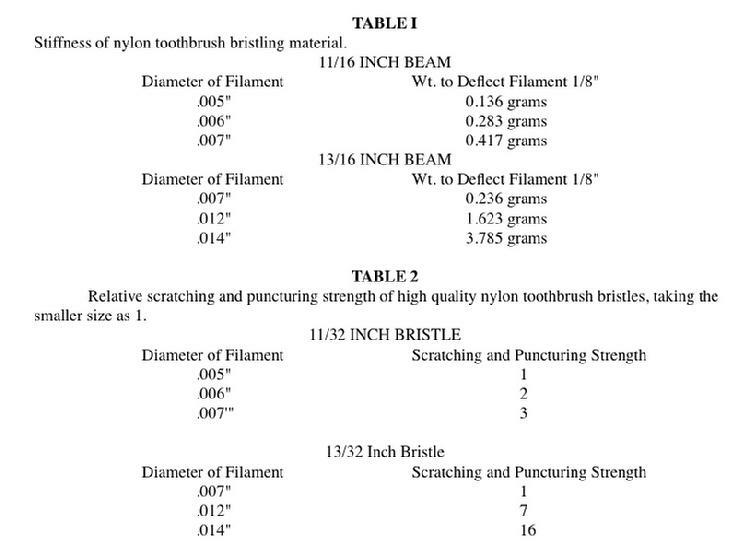 Table 1 shows the weight, when applied at the middle, required to deflect, for a distance of 1/8", a beam of nylon toothbrush filament 11/16" and 13/16" long. One-half this weight would be required to bend 1/8", a bristle of corresponding size 13/32" long, the length my experiments indicate toothbrush bristles should have for most effective use. Arbitrarily, I call this the "scratching strength." It provides a basis for a useful comparable numerical expression of the stiffness of different size bristles. It will be noted from Table 2 that the .014" bristle has sixteen times the "scratching strength" of the .007" size. Obviously it is desirable to select a bristle which does not have enough "scratching strength" to injure the gums when brushing the teeth. It should be clearly understood, however, that the purpose of brushing is to clean the teeth (not to, as so many imagine, "massage" the gums). The bristles of the brush strike the gums only to the extent this occurs during the necessary effort and manipulation to clean the areas on the teeth which can be reached by the bristles. Injury to the border and surface of the gums by vigorous brushing with stiff, scratching brushes, at a given operation, is superficial and microscopic. The epithelial cells are torn away to a variable extent. Microscopic and sometimes macroscopic bleeding occurs. Healing or repair is very rapid and when it is time to brush again the gum is in about as good condition as previously. However, such injury, frequently repeated over a considerable period of time, gradually wears the border of the gum back away from its normal location on the enamel crown, exposing more and more of the crown and later an area of cementum.